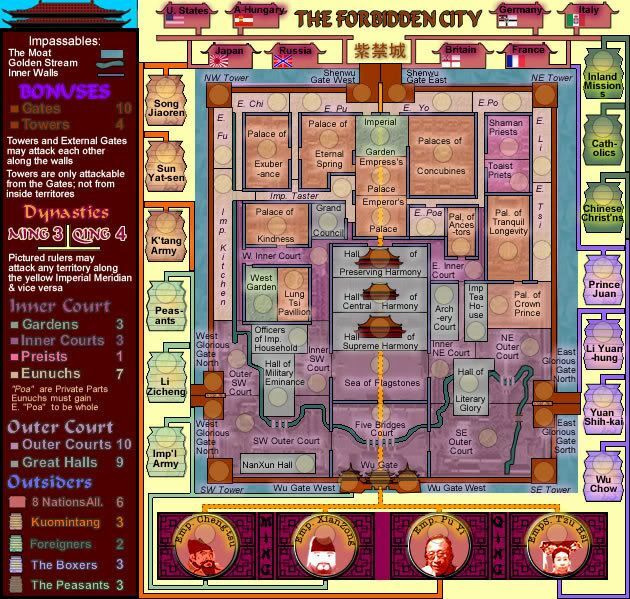 Re: Forbidden City V3 - Poll -> Dragons or Lanterns? However - Dragons could look a lot better than Lanterns! ps. whens the next update? i don't recall who it was made by, but who made it is of little importance in the overall context. next update will probably be sometime next week, i'm waiting to see what gets up in the dragons vs lanterns poll -> finishes 30 june. Kaplowitz wrote: I liked the city BG from the first version. Thanks Kap for that input. I like it, but its a little hard to recognize. Not at all...simply to bump. last days on the vote! cairnswk wrote: last days on the vote! Lanterns it is, I'm disappointed that on 18 people bothered to vote when over 60 voted in the initial poll for this map. Re: Forbidden City V2(P2) - Comments? The result of the poll is those 18 who voted - a majority want to go with the lanterns. 4. 65% glow applied around the text names. 6. Tower names left off map previously - now applied. 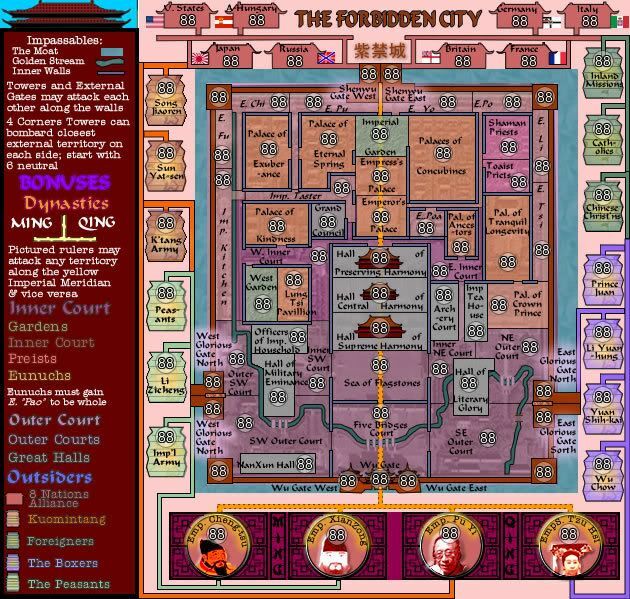 Re: Forbidden City V5(P5) - Bonuses added - please discuss! Also, I'm not sure on the attack routes on the outer bonuses. Is it only the immediate adjacent territory, or every single one that it connects to? The solid un-ending lines confuse me. I thought it said meridian? Gates and the Tower bonuses I think are fine. Each one can be attacked so I think you did a good job on those. I think the gradens (If there are only two, I have a hard time telling) should be knocked down to 1 or 2. All the other bonuses look good to me. I like the way its going. Keep up the Good Work. I just have a problem. The colors in the Legends and hard to match up with the colors on the Map. And Priests 1 is the wrong color but I am sure you saw that. well i will try to give some opinion. 1.Font OK,but i notice that its to light text,can you put to be more darken,like K Tang Army. 3.Hmm,again text need to be darken. 4.Dont know what i supouse to say. Abouth Bonuses,well mine policy is to not mess in maker decision for bonuses,after all you will better know what is best for map.I belive that you have some formula for creating bonuses value,so aim ok with that. Note taken guys...working on those changes now. oh soggy biscuits,I forgot your sticky! 1. Widened passageway for E Po. yes that is Meridian, i think i've fixed the kerning on that but let me know if it's still unclear. these should be more clear now as i have double the line edges where these join, but i will be targeting these joins for special graphics, so watch this aspect. Sir. Ricco wrote: Gates and the Tower bonuses I think are fine. Each one can be attacked so I think you did a good job on those. Should be better now, but no i didn't notice, thanks for the pickup. Thanks for comment qwert. I think those things are fix now, yes? Graphically, I'm a bit bothered with the color palette. It seems too dried out, like you left this map out in the boiling Aussie sun for a couple days on accident. 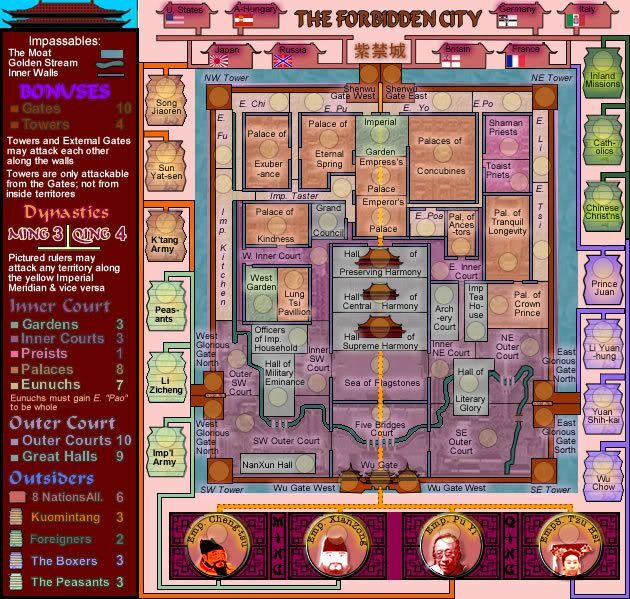 I'm aware that a burnt red and golden yellow are Forbidden City du jour, but is there anyway the colors could be less faded? Also, the text is suffering from major squeeze problems. Yes there's space for army counts, but there are abbreviations galore (most around the word Imperial), making understanding the map's flow much more difficult. Finally, the borders on the lanterns, now that I can see them, will be so difficult for anybody to pick up on at first. I'm glad you have a very unique connector coming around that will make them more explicit. Hmm,aim mean all text on main map,make to be same darken like around map. Also i think that for Russia,germany and other,to put outer glow.